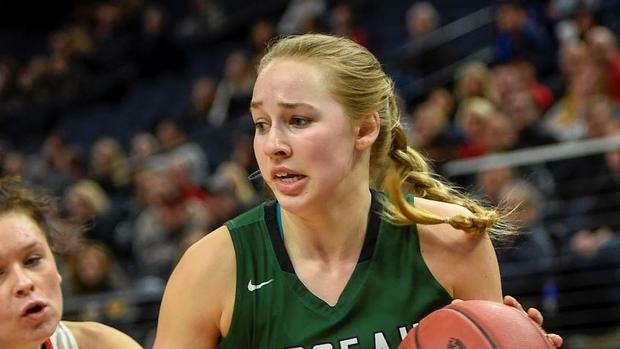 ROSEAU’S KACIE BOROWICZ IS MINNESOTA’S MISS BASKETBALL. SHE’S THE FIRST-EVER NORTHWESTERN MINNESOTA RECIPIENT OF THAT HONOR. KACIE BOROWICZ PLAYED IN FIVE STATE TOURNAMENTS FOR THE RAMS, WINNING A TITLE IN 2017; AND IS THE 7TH ALL-TIME LEADING SCORER IN MINNESOTA GIRLS BASKETBALL. ROSEAU’S AARON NESS IS A SECOND TEAM AMERICAN HOCKEY LEAGUE ALL-STAR, AFTER A STANDOUT SEASON WITH THE HERSHEY BEARS (51 POINTS IN 69 GAMES). NESS IS A FREE AGENT THIS SUMMER. THE UNIVERSITY OF NORTH DAKOTA HAS SIGNED SIX VOLLEYBALL PLAYERS FOR NEXT SEASON, INCLUDING ABI McGLYNN OF STEPHEN-ARGYLE. TODAY’S ROSEAU BASEBALL GAME AT B-G-MR IS POSTPONED. ROSEAU’S SOFTBALL TEAM IS SCHEDULED TO PLAY B-G-MR AND THE NORTHERN FREEZE TODAY IN GREENBUSH.